Symbols*: Seals are animals that inhabit both watery realms and the shore, thus symbolizing the bridge between inner emotions and outer expression. They epitomize grace and rhythmic movement with their ability to navigate through the waters with flowing precision. Energy envelops the creatures as they approach a cup. Their inquisitive natures represent the openness to new ideas and beginnings. They are willing to plunge into the waters of new possibilities, allowing the heart to act as a compass on their travels. The green and blue currents help to carry the creatures into deeper realms of emotional exploration. Description*: The seal has the ability to swim through the water as well as pause upon the shore. The balance between the earthly influence of security and the emotional vulnerability of unknown waters can allow you to maintain a sense of adventure as you continue on your journey. 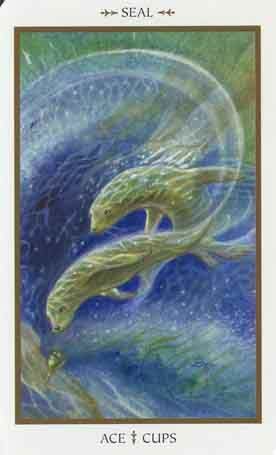 The seal reminds us that in order to experience new opportunities for growth, sometimes we have to take a chance and follow our emotional impulses. By allowing the currents of external stimuli to penetrate our inner beings, we may open ourselves up to the possibility of extreme pleasure, love, and creative inspiration. Constellation: 1 - The Magician, X Medicine Wheel, XIX Sun, The Aces, and The Tens. Communication; Self consciousness; Individualization; Self-expression; Initiative; At-one-ment; Originality. Possible Meaning: You may be overflowing with emotions at this time. This may be a possible start for new love or relationship. Don’t be afraid to express your inner emotions. You will be flowing with fertile ideas. With the Seal showing to you, it is a gentle reminder of hearing, and balancing. Learn to listen to your inner self and balance your life to it. Thoughts/Points to Ponder: The seals are young and vibrant animals. They’re playing and having fun; they’re both on their way to the cup. The water is very lively and vibrant. I feel refresh, all the elements are giving me a sense of balance, harmony and love. I’m listening to my iner guidance. A Seal Totem can show you how to develop and focus your imagination. Seal people are highly imaginative and very creative, and they need activities that channel and direct those activities. Hearing and balance are very important for a Seal totem. Learn to listen to your inner self and balance your life to it. Tap into your Seal totem and expect your dreams to become more vivid and significant. Stay in touch with your body's natural rhythms - if you are hungry, eat; if you are tired, rest.